WaterDog is an eco-friendly, automatic outdoor pet fountain that immediately turns on when it senses your dog approaching. When the dog is finished drinking the fresh water and walks away, the fountain automatically turns off. Attach the WaterDog to an outdoor hose spigot for an easy water solution on a hot summer day. Founder Jonathan Kirschner is on a mission to give pet owners everywhere the ability to provide their dogs with the comfort of fresh, cold water on the go. Traditional water bowls require constant cleaning and often hold water that quickly becomes stagnant and warm, becoming susceptible to mildew as well as diseases such as Giardia, and Coccidia. Jonathan’s background in mechanical engineering and love for his dogs resulted in WaterDog, an easy solution to an age-old problem. 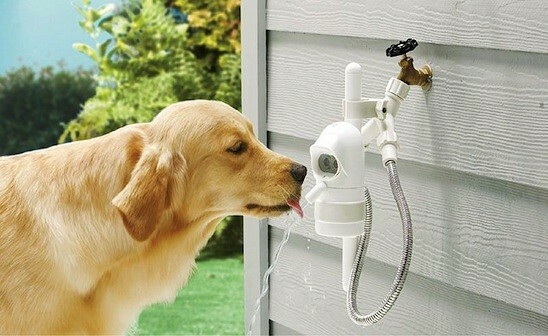 Fresh water makes every dog happy, hydrated and healthy. Your dog will love you for it! WaterDog is an eco-friendly, automatic outdoor pet fountain that immediately turns on when it senses your dog approaching. When the dog is finished drinking the fresh water and walks away, the fountain automatically turns off. Attach the WaterDog to an outdoor hose spigot for an easy water solution on a hot summer day. Founder Jonathan Kirschner is on a mission to give pet owners everywhere the ability to provide their dogs with the comfort of fresh, cold water on the go. Traditional water bowls require constant cleaning and often hold water that quickly becomes stagnant and warm, becoming susceptible to mildew as well as diseases such as Giardia, and Coccidia. Jonathan’s background in mechanical engineering and love for his dogs resulted in WaterDog, an easy solution to an age-old problem.